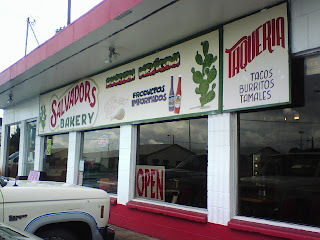 For authentic Mexican food, Salvador's Bakery on Silverton Rd. near Lancaster hits the spot. This clean, friendly bakery and taqueria is decorated with brightly colored pinatas hanging from the ceiling and shelves filled with exotic Mexican pastries. They also have a deli counter where you can get fresh meats that you won't find at most grocery stores. For lunch, I ordered three carne asada tacos for $1.85 each and a can of Coca Cola. For some reason, Coke taste better in a can than it does from a fountain. The tacos come with just the corn tortilla and the meat. You have to add toppings from, maybe, the best salsa bar in all of Salem. There is a choice of about four or five different salsas with a range in spiciness. One of them is so hot, they told me that it was made with only one ingredient, peppers. With a big scoop of that salsa on one of my tacos, I wished that I'd ordered two cans of cola. 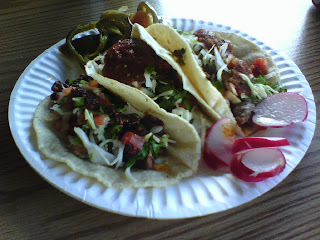 Except for the meat being a bit fatty, the tacos were outstanding. The tortillas were fresh and soft, better than most of the sit down Mexican places in town. The tamales were also very good, stuffed with more meat than ones I've had in the past. It's a little adventurous to try a Mexican restaurant like Salvador's, but the workers speak English and are very welcoming. I will be back. When you go back, be sure to sample some pastries and let us know how they rate. Salvador's is a wonderful place to enjoy tacos, pastries and awesome salsa. The food is real, the people are very friendly, and the salsa is hot! Also, they have horchata, a sweet, cinnamon rice drink that really cools the flames from the hot salsa. Your blog led me here for lunch, and now I can't stay away, even though I live in Corvallis. 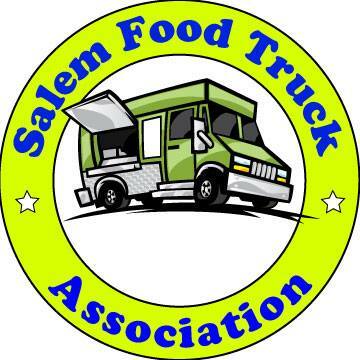 A must in every trip to Salem. Bueno! I just ate here for the first time ever and OMG! this is some good food. I got the burrito which comes with veggies, rice, and beans in it and you can either have it with or without meat. I got the chicken, which almost tasted like costco chicken. Very moist and was not the processed stuff. For $3.50 I have nothing to complain about. Now when I want cheap mexican food, Taco bell is at the bottom of my list. It's just as good as Los Dos Amigos, but way cheaper. For one meal, you will not pay over 6 dollars. Salvador's bakery is one of my favorite spots to visit. Every Monday I get the combination plate with rice, beans, and marinated pork. I can choose from six diff meats but i prefer beef. They also provide a great selection of vegies and salsas. I am a white dude who loves meat and hot things and this place is the only place that can satisfy my craving for great taste and spicy belongings. The quality of service i received was impeccable. The cook was more than obliged to bring me my taste meal. And more power to her cause it was worth every bite!!!!!. I haven't tasted this good of food since i was a kid. I love the way this bakery is run. I would not change anything about this place. ill be good if they have a phone number to order cake or something........ but i love there cake and flan..
Salvador's hands down, serves the best Mexican food in the entire Willamette Valley. I used to stop there for their pasteries but for some reason, it took me a few months before I tried the other food and have seldom gone elsewhere since. The corn tortillas are freshly made and can be purchased by the dozen to take home. The carnitas (pork)would be my favorite filling for tacos but absolutely every thing is excellant at Salvador's and the employees are great. Try the flan and all their cakes as well. You can buy cake by the slice or whole and they're all on display. You want authentic? This would be it. For Ceviche, I love El Gruellense on Portland Rd.. They have the best ceviche I've had anywhere. El Gruellense ahso serves great tacos also although I'm not fond of their enchiladas. They use tomato sauce instead of chile which really perplexes me. Must be the style of enchiladas from a different part of Mexico then I'm used to. The salsa bar is the best anywhere in town and at Salvidor's and even has guacamole. don't often see that. Usually you have to order it on the side. Why did I wait so long to try this place??? Oh man was our lunch delicious. I've been meaning to go here for so long and I finally found myself on that side of town today near lunch time. I pulled in and the parking lot was full. I found a parking in the back and got to have all the wonderful smells greet me on my walk to the door. It smelled so yummy. I walked in and the first thing I saw was a big pile of homemade pork rinds (I have no idea how to spell the real name - chee chee ronies???) My sister loves those. I immediately walked over to the bakery section, yup, they have the piggy shapped cookies! I picked out a couple pastries and headed to the front. I ordered the chicken torta for myself and a chicken tamale for my husband. PHENOMINAL!!!! The drive home took forever and the smells in the car were driving me crazy. The torta consisted of a super soft homemade roll, marinated chicken, lettuce, tomato and diced onions and celantro. Truly delicious. The only thing it was missing was some guacamole. I will definitely ask for some next time. And believe me there is a lot of next times in our near future. My husband really liked the chicken tamale but it was a tad bit too hot for his taste. The masa was firm just the way we like it. The only thing missing for me was some homemade flour tortillas. I wanted to pick some up but I didn't see any. Please let me know if I just missed them becaus there is nothing better than a fresh homemade flour tortilla with some butter!! "Asada increíble de carne!!!!!" When the carne asada craving overwhelms me, I usually find one of the mobile taco carts that exist in profusion in Salem. They are neatly always good. Today, in response to the glowing reviews here, I drove over to Salvador's. It's an order-at-the-counter place. They bring you the fresh, soft corn tortillas (I think they make them on the premises) with the citrusy marinated beef filling. Then you go to a condiment bar containing various salsas, cilantro, sliced radishes, chopped onion, chilies, lime wedges and other things too numerous for my overtaxed memory to recall. Most places skimp on these ingredients, especially the cilantro. They also have a huge display of Mexican pastries and a fresh meat section both of which looked very good. Their food is not your Americanized Mexican restaurant fare. Give them a try. I suspect you will be as pleased as I was. I know I've tooted my Vuvuzela about this place a couple of months ago, but it just keeps blowing me away! I drove all the way across town to try a highly recommended taco truck only to find it is closed on Wednesdays! As Salvatore's is half a block away, all was not lost. Today I had the quesadilla de pollo. ($3.99) It was fantastic, which is what I have come to expect here. They have a selection of pastries and baked goods which would temp a stoic. Hardly qualifying as the latter, I quickly succumbed to a gingerbread cookie marginally smaller than a Mariachi's sombrero. A mistake no doubt, albeit a delicious one! If you haven't tried this place, you should. how much are their pinatas?